Each winter, Nova Scotians dust off their snowmobiles, snowshoes, skis or skates for some fun in the snow. They often cross one of our province’s more than 3000 lakes or clear snow on an inlet to ice fish. Whatever your passion, it’s important to understand when it is safe to be on those frozen bodies of water and when it should be avoided. Naturally occurring ice is unpredictable. Never go on the ice alone! Make sure you have proper safety equipment with you at all times, and keep these tips in mind before you head out. Gauging the strength of ice is very difficult. There is no such thing as 100% safe ice. Never walk or drive on cloudy ice. Only go on clear, thick ice. Spring ice is NEVER safe. Ice thickness is never consistent: it will be flat on top, but not on the bottom. Snow on ice acts as an insulator: it makes ice warmer and weaker. Extreme cold snaps will weaken ice. Ice formed over running water (rivers and streams) is more dangerous than ice formed over standing water (lakes and ponds). Throw rope—and know how to use it! Stay calm and think out a solution. Don't run up to the hole. You might break through and then you’ll both need help. Use an item to throw or extend to your friend to pull them out of the water—if you don’t have a rope, improvise with items such as jumper cables, skis, etc. If you can't rescue the person immediately, call 911 on a cell phone. 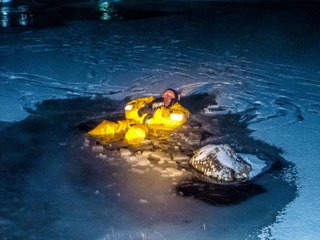 For more safety tips on ice safety, please visit adventuresmart.ca. As outdoor enthusiasts, we encourage you to enjoy all that Nova Scotia has to offer with an awareness and understanding that accidents happen. Consider taking a local orienteering course, a map and compass course, and a first aid course to help ensure that you are comfortable travelling in the woods throughout the year. For additional info, visit adventuresmart.ca.